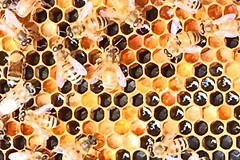 who's laying - hive-produced queen or workers??? 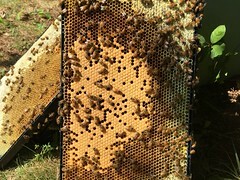 I spent some time inspecting my green hive yesterday. I took a bunch of pictures. Wish I could say I figured out the answer. But I didn't. 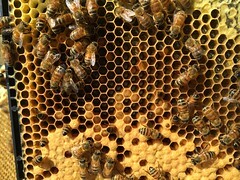 I am tending to think that things look OK - like a queen is laying and not workers. But I could use advice (help!). Review: 4.5 weeks ago, my brood pattern looked fine, but capped queen cells made it look like a supercedure was in progress.Then, at my next inspection, 10 days ago, there were no larvae and no capped brood. I looked carefully but did not see any eggs either, though I find eggs very hard to see. So I installed a new queen 9 days ago. 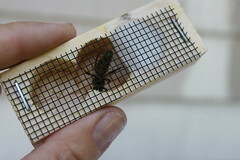 But 5 days after her installation, there were larvae and capped brood! Either a hive-produced queen returned and started laying (at least 14 days ago to produce capped brood 9 days later) - OR the workers started laying. Which??? It's hard as a novice bee-keeper to distinguish. 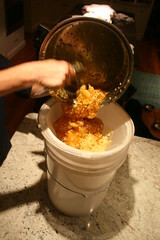 The hive has lots of honey - good news. But brood space is a little short. I did not see a queen when I inspected. I looked at about 1/3 of the frames on the top box. 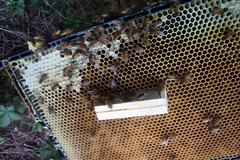 Maybe a thorough inspection to find a queen is in order in 2 weeks. 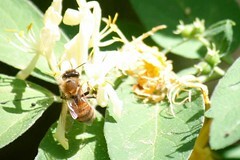 Good news - the bees were much calmer than at my last inspection. My smoke was better, so that helped, but they were definitely calmer bees. I wonder if that means they have a queen? 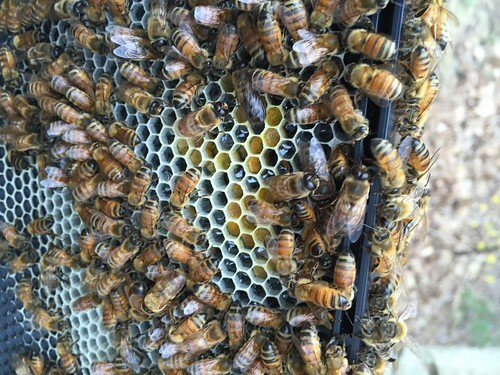 Today I checked on the queen I installed 5 days ago. Oops! 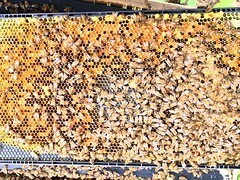 I was surprised to find the frames full of larvae and capped brood. Since it takes at least 9 days to develop capped brood, it couldn't have been the new queen that I introduced who laid these eggs. Two options, I suppose. Maybe one of the queens that the hive made (I saw many capped queen cells several weeks ago - evidentially a supercedure) mated and returned to lay. Or, maybe workers laid the eggs. I don't know which is more likely. 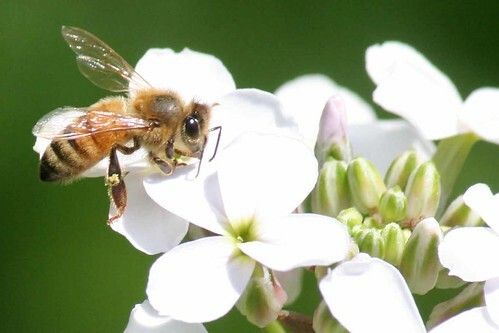 I will open the hive the next time I can, next Wednesday morning, and see if I can see signs of worker laying, including multiple eggs per cell, eggs on the wall of cells, two or more large per cell, uneven larva patterns in cells, uneven laying pattern, high frequency of drones. At my brief observation this morning, the laying pattern looked very even and consistant. I hope it's a queen laying as it sounds difficult to remove laying workers. I was worried about working with my bees today but ended up having fun. I just have trouble with that darned smoker. Need to learn how to get it going for more than a minute. I worked with it 15 minutes before I went down to the hive. Still, at the hive it would go for a minute then go out. But as long as I moved away from the hive, tended the smoker when it went out, the bees were good. No rushing, just keep at it, sweat dripping. 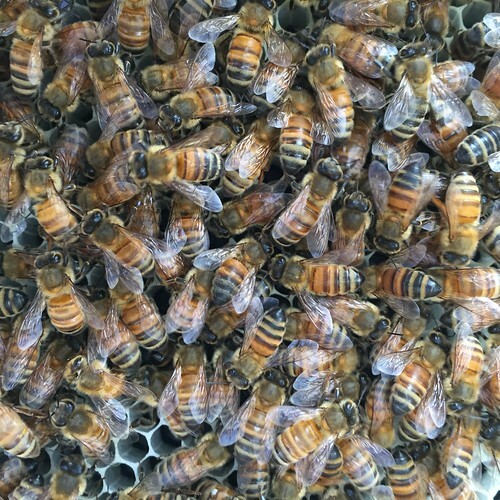 I picked up a nice new young queen from NE Bees. 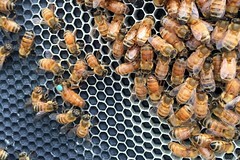 They gave me an attendant bee on the outside of the queen cage with her. I took both bees into my car. A 30 min ride home, and after 20 min attendant bee decided she wanted to get out of the car. I stayed calm as she buzzed all the windows. I was on the highway - what else could I do. She wasn't interested in me, but I kept my eye on her. I think I did a good job installing the queen (I've done it wrong twice before). 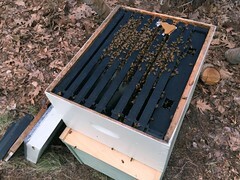 ....Remove plug on the candy side....stick the cage with screen side up into the comb in the center of the hive...move frames apart so the protruding cage fits...replace frame and reassemble hive. Simple, but took an hour with my smoker issues. 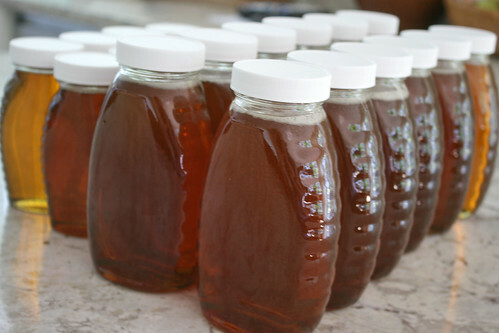 After I finished and sealed up the hive, of course my smoker was going good. It went for a half hour after I finished. I hated to waste it so I stayed and photographed (sweat dripping - 94F and humid) ... pictures of the smoke, of the hives, of forager bees returning to the hive greeted by attendants. 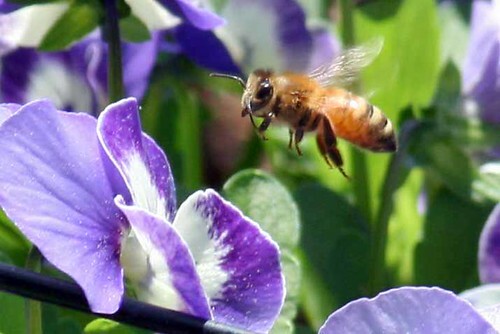 Bees are amazing! Here's the new queen in her cage. And then, the cage stuck in place the wax of a frame. I'll drive up to Tyngsboro to New England Bees this afternoon and pick her up. 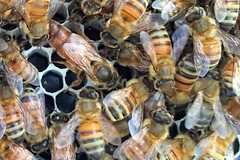 In July, they have native queens bred from their survivor stock. I'll get some advice on installing her and keeping the hive healthy, too. I checked my hives today. 3 weeks since I last looked inside. I didn't do a complete check because its 95F and 12 noon. I think not the best time to check. 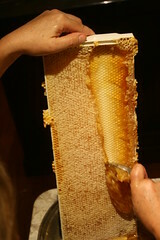 Both hives were incredibly active. 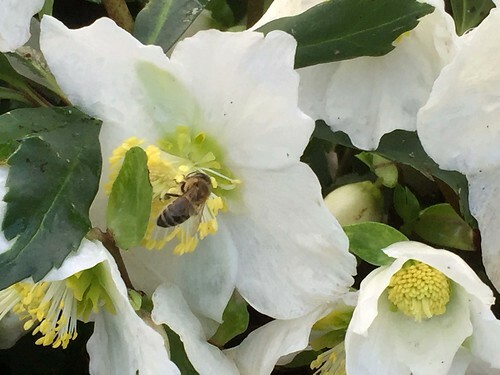 White hive: LOTS of bees. OMG! 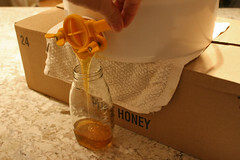 I didn't open the boxes, just looked at the honey super. 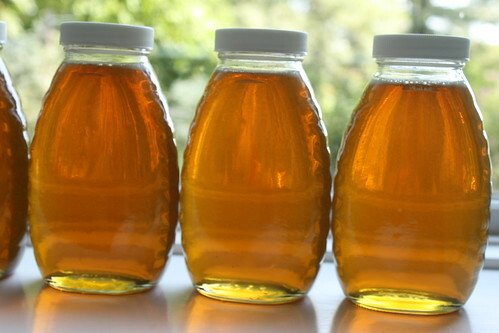 It has four nice frames on honey. I need to look up when to put on the second super. 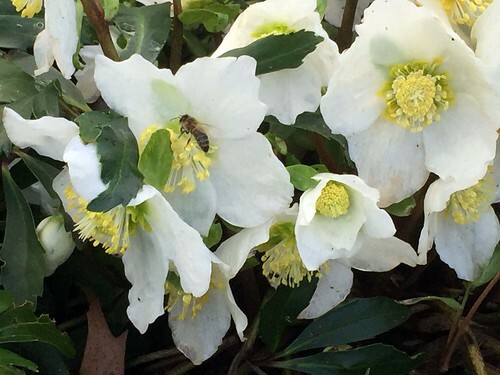 Green hive: These bees were really vicious. I checked 2 frames in each box. 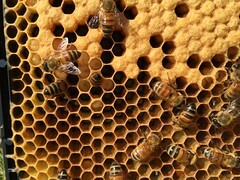 No larvea, no capped brood, several open queen cells, and LOTS of food. 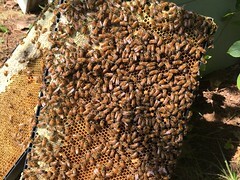 They are filling up the hive with honey and pollen. So, it looks like they lost the queen, tried to make a new one, but this failed. Or they swarmed and left the hive queenless. 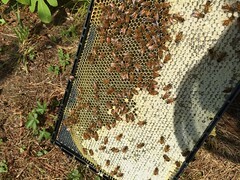 I have noticed that the number of bees I see on the running board is gradually decreasing compared to the other hive. I will call around and see where and when I can get a new queen. 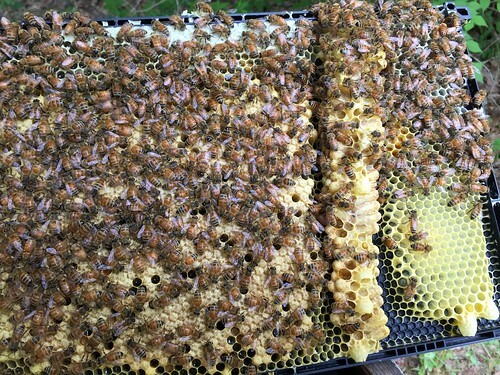 I assume I will need to take out a number of those frames of food so that a queen will have room to lay. I got two half stings on my thigh. Not bad ones. But I am planning to buy a full bee suit instead of my bee jacket. I think it might be cooler than wearing thick jeans and I don't like getting stung. 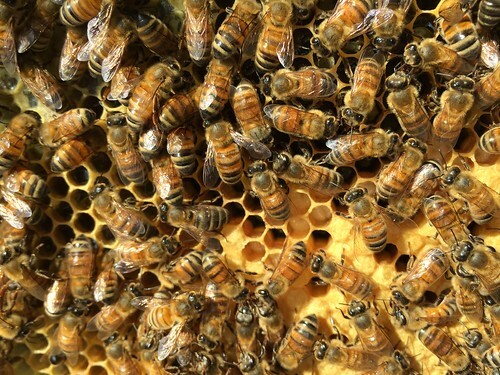 Two hives, two queens. 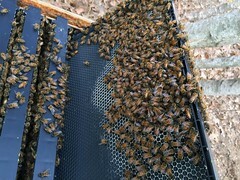 I opened up my hives a week after installing my packages (new bees) to check on them today. 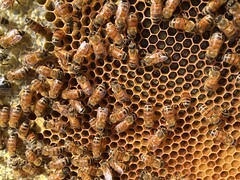 I was relieved that I was able to identify queens. 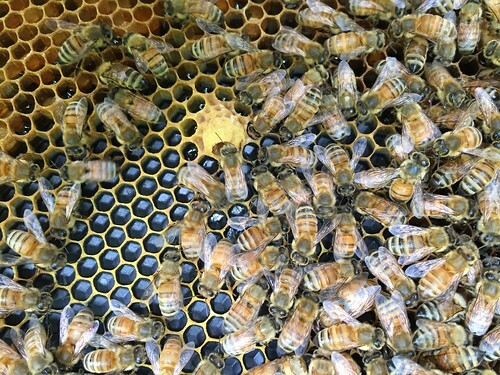 I ordered two marked queens, but one had lost her marker and I was surprised to see her looking plain but different from all the rest. My bees are so sweet and calm. 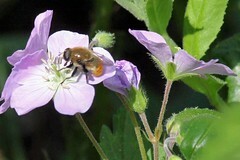 I have spent a lot of time watching them, close up and at a distance, and no stings (yet). I found I cannot trigger my cell phone camera button with my bee gloves on, so I work one handed - one glove on one off and can take pictures. Aren't they beautiful! !